Rally Finland 2003 didn’t have much quantity in its entry list, but the emphasis was surely on the quality. Entry list included five former winners of the event and also five future winners of the event. RALLIRINKI walks through how Rally Finland 2003 were set before the event. Season 2003 was a highly competitive year in the history of two-liter WRC cars. However, considering the number of WRC cars or total count of entries, numbers were decreasing in Rally Finland compared to the previous years which powered some criticism among the most critical fans and even in the official magazine partner, Vauhdin Maailma. Now, 15 years later, 26 WRCs on the entry list by six manufacturers is something we can not even dream of. Total number of crews, 71, which happens to be almost the same as this year, was clearly disappointing for fans that had been used to three-digit numbers. Peugeot, Ford and Citroën all entered three cars. Peugeot had a full on star driver line-up in Marcus Grönholm, then reigning World Champion and the winner of Rally Finland on the three previous occasions. Grönholm’s season had included three wins, but many zero points finishes too, so he was third in the championship. Richard Burns was leading the championship coming into Rally Finland, but more than a year had passed since the Brit’s latest victory. The previous year in Finland he had seriously challenged Grönholm before one badly landed jump on Ouninpohja caused him a lot of time. Harri Rovanperä completed the Peugeot trio, being another challenger for the victory on a good weekend, and also on his last chance to enter Rally Finland on a top car. The introduced third driver rule was believed to sideline him from top teams in the future. Richard Burns and Robert Reid were counted as winner favorites judged by their 2002 performance. 206 WRC were into its final season. Citroën was on a challenger’s role on gravel. They had the previous Rally Finland winner Carlos Sainz as well as the always fast on gravel Colin McRae on their Xsara WRCs. Both had changed teams moving from Ford to Citroën for 2003. In 2002 Sainz had finished fourth in Finland. McRae was on his way to finish 3rd, but his car caught fire with one stage to go. Third driver Sebastien Loeb, who had just signed for two more years with Citroën, remained a question mark on fast Finnish gravel. He had one previous start in Xsara WRC in Finland, finishing a distant 10th in 2002. Just before Finland he had claimed his 3rd WRC victory, but they all were on tarmac. He had scored fastest time in Rally Sweden and was learning fast, so altogether Citroën was a strong pack on the paddock. Ford had a three-car entry, but it really was all on just one crew, Markko Märtin and Michael Park. Over the early 2000’s Märtin had proved to be very fast and flamboyant driver on Finnish gravel. He had brought thousands of Estonian fans across the Baltic Sea and by all means he was now seriously aiming to win. Ford would start the event in Christian Loriaux’s first Focus RS WRC, almost completely new car compared to the previous Focus WRC. Märtin had proved the car fast too, already on its debut in New Zealand, albeit retiring to engine issues from 2nd place, and in Greece, where Märtin took his first WRC victory. He said prior to Finland that taking his first win in Acropolis took off some unwanted pressure. Other Ford drivers were literally rookies. Finnish Mikko Hirvonen had had some good results earlier in a privately entered Ford and Malcolm Wilson had given him a permission to go flat out in the factory car, a 2002 Focus WRC. Belgian Francois Duval was in a similar situation in Focus WRC03, except that no one was expecting anything from him. Subaru was the fourth manufactures already winning an event in 2003. They entered Rally Finland with two cars. Still a rising talent Petter Solberg was considered the favorite, although the five-time Rally Finland winner Tommi Mäkinen couldn’t be overlooked even if his time with Subaru has been struck by woes and accidents all the way. Newspaper Helsingin Sanomat even claimed a Subaru meant the end of the career for a Finnish driver, statistically Markku Alén and Ari Vatanen previously ending their active careers driving a Subaru. Petter Solberg had finished 3rd in Finland in 2002. Earlier in the season he had won in Cyprus. In the championship overall standings he was fifth with 30 points, 13 points behind Burns. Before the season, Subaru had named several events as their priority events and oddly Finland was not one of them. Both drivers however drove two-day pre-event tests the week before the event. Skoda had introduced their all-new Fabia WRC in the previous event in Germany. With Didier Auriol they had the experience and with Toni Gardemeister the young raw speed, yet they were definitely underdogs and the technical unreliability was shadowing their preparations. Drivers went to state that the event itself served as a testing stage for the team at the moment. They had completed over 1000 kilometers of gravel tests, though. Hyundai, operated by Brittish Mellors team, were not among the favourites either. Armin Schwarz and Freddy Loix were starting in the team’s Accent WRCs. Finnish Jussi Välimäki was building his career as a privateer driver in the team and was aiming for a solid result. There were several noteworthy private entries too. Juuso Pykälistö started in Bozian Racing’s 206 WRC and was aiming to set a result to please Peugeot boss Corrado Provera. Pykälistö was building his career under the wing of Marcus Grönholm, so Peugeot were naturally his choice of a car. Other Bozian’s 206 WRC were entered for 1981 World Champion Ari Vatanen who followed the tradition of Finnish drivers doing Rally Finland one more time after turning 50 years. Starting his 20th Rally Finland, Sebastian Lindholm drove a 206 WRC as well. There were several privately entered Focus WRCs too. Janne Tuohino was trying to give good example of his pace. Young Jari-Matti Latvala started his first Rally Finland under orders to bring the car back in one piece, because earlier in the year in BRC he had had some accidents already, to the fact that even two days before Rally Finland 2003 recce started as he had crashed out of Manx Rally. The most notable no show was Mitsubishi team that were sitting out the most of 2003, although their drivers such as Kristian Sohlberg had privately entered some WRC events in 2003. In retrospect – the entry list of Rally Finland 2003 had five drivers who had previously won the event and five drivers who would win the event in the future; Grönholm, Mäkinen, Auriol, Sainz and Vatanen all had conquered the event before 2003 and Märtin, Loeb, Hirvonen, Latvala and Meeke would win the event in 2003 or later. There were also seven World Champions on the entry list (Vatanen, Sainz, Auriol, McRae, Mäkinen, Grönholm and Burns) and two future champions (Solberg, Loeb). 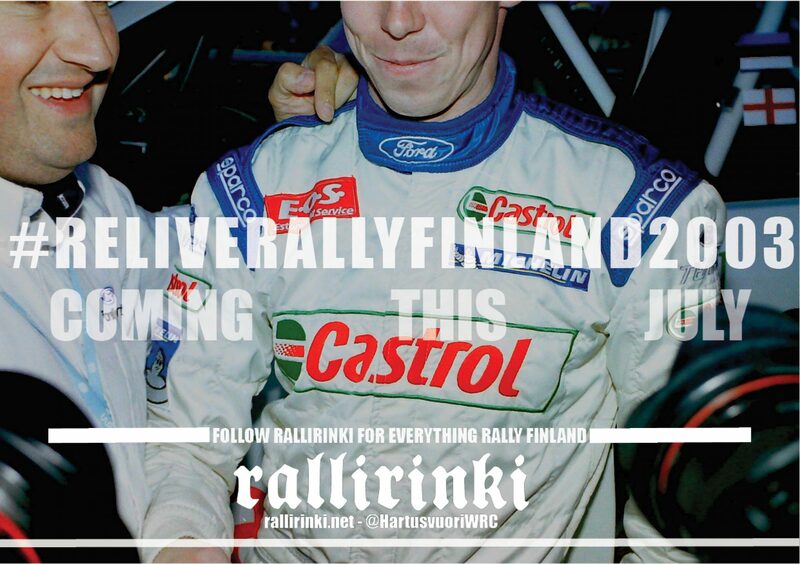 Seuraava Seuraava artikkeli: #ReliveRallyFinland2003: Who did come up with the ad ”Markko, Markko, where are you” and how it would’ve continued?